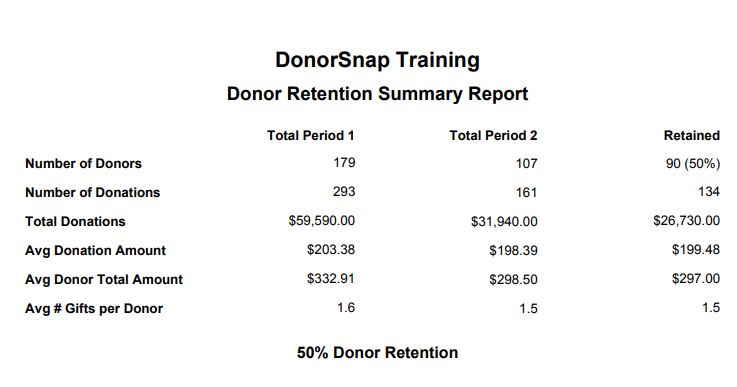 The Donor Retention Report gives a comparison between two periods, as well as the Donor Retention Rate between those periods. In the example above, comparing the 179 donors in period 1, and 107 donors in period 2…. 50% of the donors from Period one donated again in Period 2. This is the Donor Retention Rate. The third column (Retained) shows you the statistics during period two of just the donors that gave in both periods.